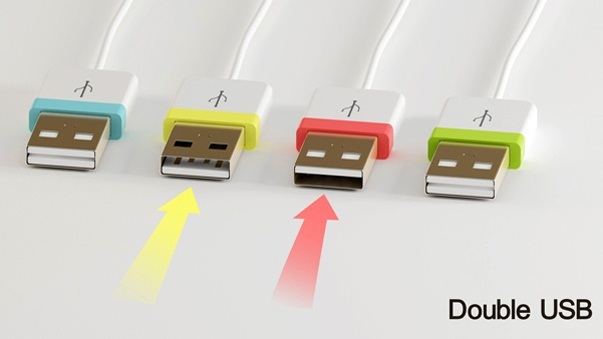 Everyone shares the same frustration with USB: There’s a right way and wrong way to plug it in. That’s it. Besides that little design flaw, USB flash drives still feel like the future in your hand. Plug it in and *BAM*, instant access to gigabytes of data. But wait, friend! There’s a solution! Enter Double USB by Ma Yi Xuan. This clever concept does away with the single-side nature of the ubiquitous standard. Instead, the connector’s contacts are embedded on two sliding plates that recesses into the casing. This way, no matter which way you plug it in, one plate pushes back while the other one handles the data connection. Sadly it’s just a concept right now. But there’s always a chance it will get picked up by some OEM or manufacturer as USB will likely be around for years to come. Implementing this in a flash drive would no doubt earn someone a nod from the Nobel Peace Prize committee as countries would no doubt lay down their arms in amazement and awe.